FLOWER MOUND, Texas -- After paying $16 to file a one-page claim to an empty, $340,000 home in an upscale Dallas suburb, Kenneth Robinson moved in furniture, hung a "No Trespassing" sign in the front window and invited television cameras inside for a tour. He quickly turned into something of a local celebrity, creating a website -- http://16dollarhouse.com -- where he sold an e-book and offered training sessions for would-be squatters. And while real estate experts and authorities say he's misusing the law, Robinson appears to have inspired dozens of imitators to move into Dallas-Fort Worth area homes -- some of which were still occupied by their owners. But Robinson's time in the house ran out Monday. Bank of America wants possession after foreclosing on the home last month, and a judge on Monday gave Robinson until Feb. 13 to appeal or move out. Rather than wait to be evicted, Robinson slipped out before sunrise Monday, skipped a morning court hearing and refused to say where he was moving next. "It's been a huge learning experience," he said in a phone call with reporters. On his website, Robinson describes himself as a savvy investor who's part of a "paradigm shift" in which people have taken over abandoned homes. In his "adverse possession" claim filed in court last June, he promised to pay taxes and homeowners' association fees while living in the house. He kept the lawn outside mowed, and the front clean. Robinson spoke to The Associated Press last week while standing at the front door of the two-story, 3,200-square-foot home with a backyard pool. He declined to discuss his background or say how much money he made from book sales or seminars related to his takeover. He said he started his website -- which describes him as "poised, measured, insightful and wise" -- to keep the media and others from misleading the public about his story. "They think some bum off the street came and paid $15 to get a $300,000 house by filing a piece of paperwork," Robinson said. "That is not the case. That is the sum of what happened." Robinson's website says he's not a lawyer and isn't offering legal advice but has done real estate research. Real estate experts say he's got the law just plain wrong. Adverse possession statutes can be found in most states, said Brian C. Rider, a real estate lawyer and professor at the University of Texas. Someone who has openly taken charge of abandoned land for an extended period of time -- using a driveway on a neighbor's property, for example -- could try to claim that land later, he said. But it takes a long time to establish those rights -- typically 10 years in Texas. Until then, anyone trying to stake claim to a piece of property owned by someone else is just a squatter, Rider said. Arlington, Texas, real estate attorney Grey Pierson said the law is often used to resolve disputes between homeowners over driveways, lawns or other property with shared boundaries -- not to take someone's house. 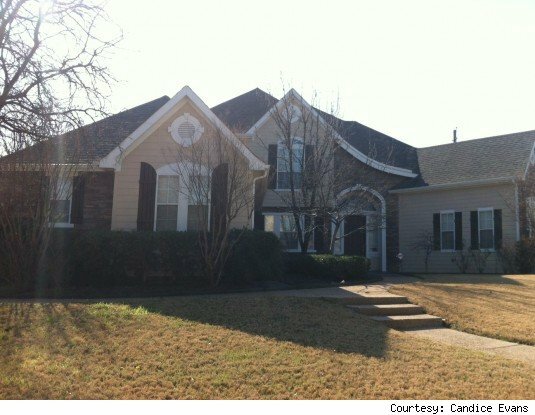 It's not clear how long the home in Flower Mound was empty before Robinson moved in. Its last owner, William Ferguson, bought the house for $332,000 in 2005 and appeared to run into trouble making payments about three years later, according to county records. Ferguson did not have a listed phone number, and the records don't indicate where he moved. County clerks in North Texas said they have seen such a spike in adverse possession filings that they've stopped accepting the claims without prosecutors' approval. In a handful of cases, squatters entered homes that weren't abandoned, but left empty for a few days. "We just had people making bad decisions, taking a portion of the law and applying it in a way that was not legal," Tarrant County clerk Mary Louise Garcia said. In one case, an Arlington travel nurse came home in September to find her locks changed and two TVs missing, according to a police report. Authorities say Anthony Brown came to the front door and told her that he had claimed the home and she was trespassing. When the nurse asked Brown for his paperwork, he offered to return the home for $2,000, police said. Brown, who was arrested in October, does not have an attorney listed and did not respond to messages left on his cellphone. Tarrant County constable Clint Burgess said authorities have interviewed a handful of people claiming "adverse possession" who said they spoke to Robinson. The Fort Worth Star-Telegram reported that Robinson attended a December eviction hearing for two charged with burglary. Robinson said then he was attending to show support for the couple. He says now that he doesn't want to be an example to others. "The truth is I don't want people to think that they should go out there and do anything based on what I did," he said last week. "Whether they do it or whether they're not is solely up to them." Robinson hasn't been charged with a crime but police said they responded to several calls from his neighbors. One neighbor, Chris Custard, attended Monday's hearing and was smiling after the eviction was ordered. "We're going to throw a party," he said. After slipping out of Realtor.com's top 10 rankings for the third quarter of last year, Punta Gorda has reclaimed status as a town in the vanguard of real estate recovery. Home prices are reportedly just beginning to trend upward. But they still have a long way to go: home prices in town are 56.2 percent lower than they were in 2006, at the peak of the housing boom. Dubbed the "Ultimate Executive two-story residence," by its Realtor, this 5,000-square-foot home offers 250 feet of "sailboat waterfront," -- you know, like water for yachts, not dinghies. See more homes for sale in Punta Gorda, Fla. The home is outfitted to withstand harsh weather conditions, with high-impact windows and hurricane shutters. Outside amenities abound: The home has an expansive pool with a tiki bar and "summer kitchen." There is also a waterfall, spa and outdoor shower. At 11 percent, the Lakeland-Winter area has the highest rate of unemployment on Realtor.com's top 10. But the real estate market seems to be another story. Realtor.com says that the area was the fourth-most-searched spot by users of their listing service. Distressed home sales have fallen significantly from last year as well. The local market may be on the road to recovery, but distressed home sales still are hindering the market. This French mansion is selling by way of short sale. See more homes for sale in Lakeland, Fla. The home features a cedar double-front door, Brazilian cherry flooring and custom stone columns. Pictured here is the home's glass-enclosed pool. There's also a chef's kitchen with granite countertops and stainless steel appliances along with a wine cooler and wet-bar-equipped butler's pantry. Sale prices in this sultry town have risen 18 percent year-over-year, as of November, quite an encouraging sign for the local market. Meanwhile, unemployment is shrinking. The rate fell to 9.4 percent in November. This Mediterranean may have just seen its price slashed, but with a $5 million ask, it'll still cost you a pretty penny. See more homes for sale in Fort Lauderdale, Fla. The home sprawls a whopping 8,700 square feet, which overlooks a large stretch of waterfront. The home offers community recreation and boating facilities. And guess what? "Pets are allowed!" Naples finds its way onto Realtor.com's list for the first time this quarter, thanks, in part, to its housing market's 13.64 percent decline in median age inventory and 13.38 increase in median list price. Naples offers its fair share of uber-luxury homes. This waterfront mansion, at nearly $20 million, costs $2,419 per square foot. See more homes for sale in Naples, Fla. The stucco mega-mansion offers stunning ocean vistas viewable from its kingly balcony. Pictured here is a dining room of the home (we're guessing there's probably another one considering the place is 8,000 square feet). The elaborately decorated room features what appears to be a flying saucer. Maybe it can beam up the filet mignon. A drop in foreclosures in this city shrank its year-over-year for-sale inventory by a whopping 40 percent as of last year's fourth quarter. The city also enjoys the benefit of an unemployment rate that is lower than the national average. With all its luster, this brand new 4,875-square-foot mansion gives you a taste of just how far your money can go in the Western city. See more homes for sale in Boise, Idaho. The one-acre property commands a generous stretch of waterfront and features airy rooms with soaring ceilings and expansive windows. Exposed beams, and elaborate details and finishes, infuse the home's interior with Old World grace. In Sarasota, home sales jumped 17 percent last year while median list prices defied the national downward price decline by ticking up 2 percent. Realtor.com goes so far as to suggest that the market may have graduated to "seller's market" status, unthinkable in most housing markets across the country. Thrust out into the Gulf of Mexico, this jaw-dropping manse practically commands its own square-shaped peninsula. But apparently personal peninsulas don't come cheap in Sarasota: This property is listed to the tune of $12.5 million. See more homes for sale in Sarasota, Fla.
Touted as the "finest boating estate in Sarasota," by the home's listing description, the property spans two acres that offer 500 feet of waterfront. Pictured here is the home's covered dock that parks at least two boats. Inside the home you'll find an exercise room, library and attached "oversized" verandas. Other outdoor amenities include an expansive pool and shuffleboard courts. The Fort Myers-Cape Coral area continues to chug along the path to recovery with its median sales price zooming upward by 20 percent last year. But there's more to brag about: The area experienced the highest year-over-year increase in median list price for the fourth quarter -- 31.27 percent. This magnificent home is a beast: It stretches more than 13,000 square feet and has 13 bathrooms. See more homes for sale in Fort Myers, Fla. The foyer area has a distinctly palatial feel with its sweeping marble floors and double staircase. The thatched gazebo is obviously not your average one, seeing as it covers its own personal lagoon and pool bar. Year-over-year inventory plummeted by 44 percent in Orlando in the fourth quarter of last year, while list prices rose 8.22 percent. Both movements point toward a market that is truly beginning to right itself. Fit for the big-swinging, cigar-smoking mogul, this luxury home, which recently had its price cut, puts you close to the links. See more homes for sale in Orlando, Fla. Exquisite details sweeten the interior throughout its many rooms. Look no farther than the gourmet kitchen for proof: Here a chandelier and chic hanging lights infuse the area with a dash of grandeur. The home costs $460 per square foot. One cool amenity mentioned in the listing? A game room! An area that had its housing market severely bruised by the foreclosure crisis, the Phoenix-Mesa area is mounting a recovery in a big way. While residents continue to file for foreclosure at a rate above the national average, the glut of cheap homes idling on the market has lured bargain-hunters. The area's relatively low unemployment rate of 7.7 percent also will work in its housing market's favor. This stately, well-landscaped chateau, despite its enormous price tag, is probably a bargain, considering Phoenix's post-housing bust nosedive in home prices. The home features dark wood flooring, granite and marble and custom millwork. There's a wine room, gourmet kitchen, theater room and exercise room. The amenities go on for quite a while: dry sauna and office, master suite with sitting area and marble baths, recording studio, pool, spa, outdoor fireplaces and four-car garage, to name a few. Buy in the city where the heat is on -- all night on the beach 'cause the housing slump's gone! Welcome to Miami (beinvenido a Miami)! Miami leads the pack of cities building toward a recovery. Existing home sales in the Miami area leaped 51 percent in the third quarter compared to a year ago. Meanwhile, inventory shrank by half. Realtor.com suggests that much of the improvement is attributable to strong foreign activity in the market. This luxury apartment may soon be the trophy home of some foreign magnate. According to Realtor.com, in May of last year, international buyers purchased about 60 percent of existing houses and condos and 90 percent of the newly built homes in Miami. See more homes for sale in Miami, Fla. Through its floor-to-ceiling windows, the sleek, modern condo offers truly mind-blowing views of Miami's glittering skyline. The home's stark, airy interior offers a rich array of colorful, alternative furnishings. You have to be cool to live here.